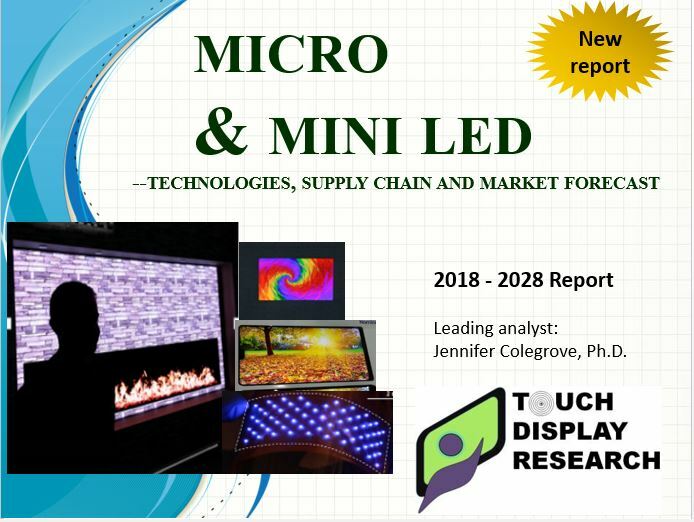 15 methods to fabricate micro LED and mini LED displays - Touch Display Research, Inc.
Santa Clara, California, December 5, 2018— In the recently published “Micro & mini LED Technologies, Supply Chain and Market Forecast 2018-2028 Report,” Touch Display Research Inc., a market research and consulting firm, analyzed all the methods to fabricate micro and mini LED displays along with their supply chains. More than 120 companies and research institutes working on micro LED and mini LED display are profiled in the report. “Micro LED and mini LED display could disrupt the whole display industry due to their benefits of high brightness, wide color gamut, low power consumption, fast response time, etc. Our survey found that the micro and mini LED display are gaining momentum. There are billion dollar opportunities for LED manufacturers, semiconductor supplier, equipment manufacturers, transparent conductor suppliers, and display companies,” said Dr. Jennifer Colegrove, CEO and Principal Analyst at Touch Display Research and author of the report. Micro & mini LED 2018-2028 report Table of Contents and report sample are available upon request. This report profiled over 120 companies and research institutes working on micro LED and mini LED display and backlight technologies. Colegrove, author of this report, has performed many first hand surveys and interviews with many micro LED and mini LED suppliers and display suppliers. Market data in the report include 11 years forecasts (from 2018 to 2028). Challenges are analyzed. Business strategy recommendations are provided in the report as well. Analysis of the BOM of the Samsung’s “The Wall” digital signage. This report also provides the Global display market forecast with details by display technologies to 2028: LCD, OLED, EPD, Micro & Mini LED display, and other display technologies.